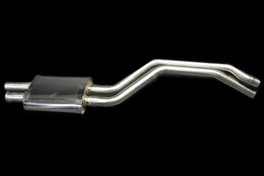 Constructed from T304 stainless steel, our 3 box, E34 exhaust system offers a 21% increase in flow when compared to the factory version, resulting in both torque and BHP increases. This system does not include Catalytic converters as standard, although these can be added upon request. This system is not compatible with the standard factory manifold.